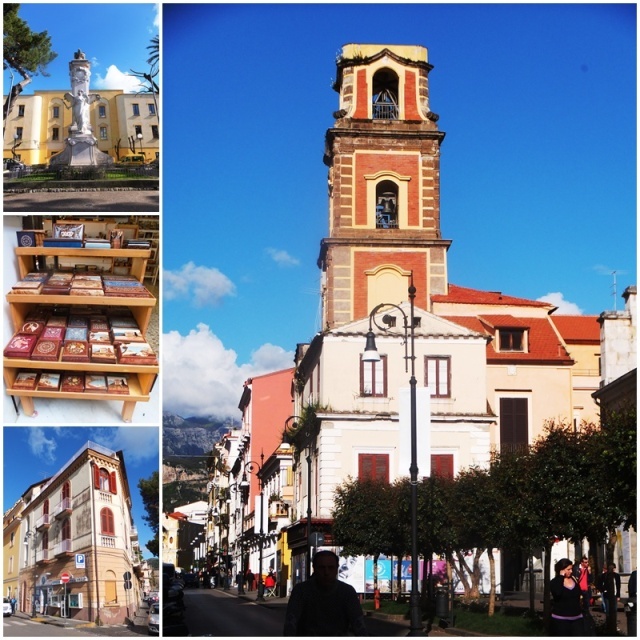 In the afternoon of April 22, 2013 I went for another walk through the old centre of Sorrento and admired many historic buildings such as the Cathedral of Sorrento which dates back to the 15th century and was built in the location of an even older church. The small alleyways, quirky various shops and inviting restaurants were bustling with people enjoying a stroll in the late afternoon. In the evening I was invited for dinner at O Parrucchiano, a restaurant that is owned by the same family as the Grand Hotel La Favorita where I was staying. Enzo Maniello, the owner, welcomed me and gave me a tour of the whole restaurant. 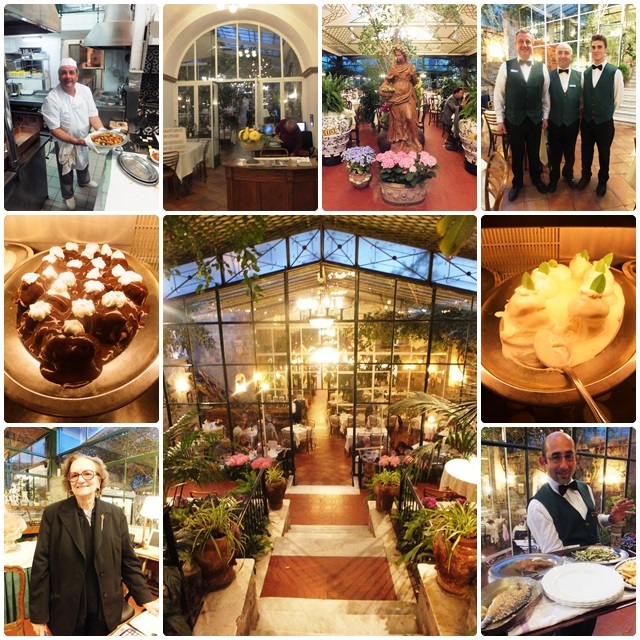 With somewhere between 500 and 600 seats, O Parrucchiano is the largest restaurant in all of Sorrento. The restaurant has several terraces that stretch upwards on a slope and at the top is an open air terrace with lemon and orange trees. The enchanting scent of the citrus blossoms was filling the air. The restaurant is decorated with luscious plants and flowers everywhere and provides a great setting for the many wedding parties and special events that are held here. 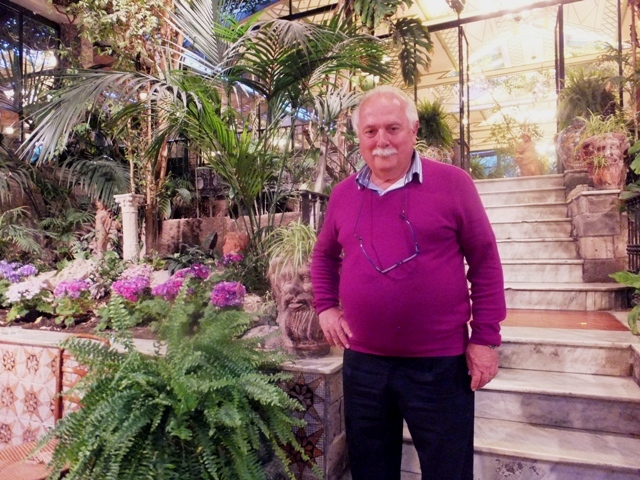 Enzo is part of one of the most successful restaurateur and hotelier families in Sorrento. O Parrucchiano dates back to 1868 when Antonino Ercolano, who was studying to be a priest, learned the art of cooking at the palace of the local archbishop. In a two-room location on Corso Italia, the main road of Sorrento, he started a small trattoria that was called “La Favorita”, now the name of Enzo Maniello’s luxury hotel. Antonino did not have any children, so he left his business to his nephew Giuseppe Maniello, Enzo’s father, in the 1940s. Giuseppe had lost his father at age 7, came from a very poor family and was taken in by his uncle as a young child. Giuseppe expanded the restaurant and has attracted many celebrities over the years. Based on its long history, it is today part of the Association of Historical Places of Italy. One of the interesting tidbits Enzo shared with me was that the famous cannelloni were invented here, and this popular pasta dish was originally called “strascinati”. Over the years, the cuisine at O Parrucchiano has expanded to include many traditional Italian dishes and local Sorrento specialties. The menu includes a variety of seafood based starters; traditional pasta plates with ravioli, cannelloni, spaghetti or linguini; risotto; a variety of second courses featuring veal, pork, chicken or seafood and scrumptious desserts, including the famous Baba – these small yeast cakes are saturated in rum and filled with whipped or pastry cream and they are a specialty in Sorrento. Tradition is paramount at O Parrucchiano and Enzo Maniello is very proud to carry on the legacy of his father. Today, Enzo’s sons Gisueppe and Mario, have also started to work in the business, which makes them the fourth generation in the family to do so. Even the employees have a long-term connection with this restaurant; Enzo mentioned that many of his chefs and waiters have worked here for several decades, some even for 40 or 50 years. Rosaria, who handles administration for the restaurant, has been an employee here for 58 years and considers the team at O Parrucchiano her family. She wouldn’t dream of retiring. Some years ago, Enzo had an employee, Luisella, who worked at the restaurant until age 70 when she retired. She couldn’t stand being at home, so she came back to work and was employed here again until she turned 90. As I was staying in the Grand Hotel La Favorita, Enzo also gave me a bit of background about this hotel. His father Giuseppe had left some property to all his sons, all of whom became successful hotel owners. 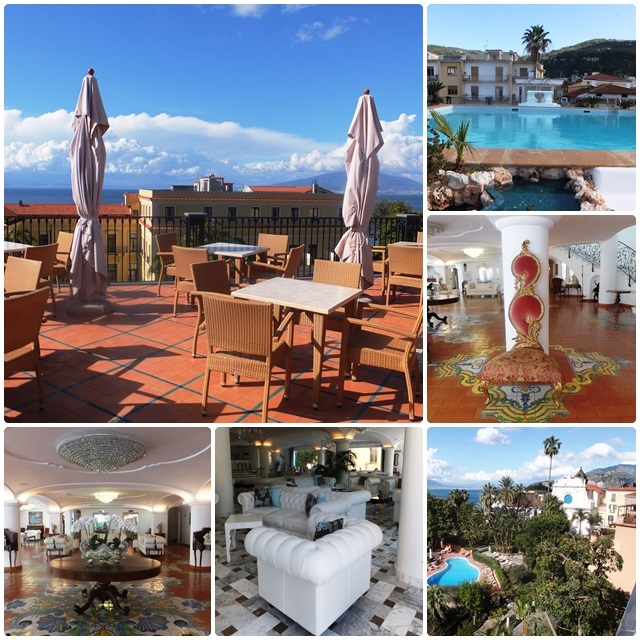 Enzo decided to renovate the property where La Favorita is located in 2007 and has created one of the most stunning 4 star deluxe hotels in Sorrento. Together with his wife, he selected all the furnishings, tiles, linens, curtains and other decorative details of the hotel. Much of the décor was inspired by details in local churches and even though his father passed away in 1990, Enzo has always felt that Giuseppe senior has stood behind him in all his endeavours with La Favorita and O Parruchiano. The hotel opened in 2010 and has quickly become one of the most popular upscale destinations in Sorrento. Today, the Gran Hotel La Favorita has 85 luxurious hotel rooms on seven floors and the panoramic views from the hotel’s rooftop terrace extend all the way over the Bay of Naples and Mount Vesuvius. The hotel’s location is just steps away from Sorrento’s waterfront, the vibrant town centre on Piazza Torquato Tasso and the atmospheric narrow medieval passageways of Sorrento’s Old Town. The hotel and the restaurant are just a few hundred metres apart, which makes O Parrucchiano a great dinner choice before a late-evening walk in the old quarters of Sorrento. Intrigued by the Maniello family’s history, I also had a chance to sample the cuisine at O Parruchiano: Enzo had assembled a special collection of antipasti that included fried zucchini flowers, grilled mozzarella as well as prawns in lemon leaves, a pizzetta and a cheese filled mini pancake. 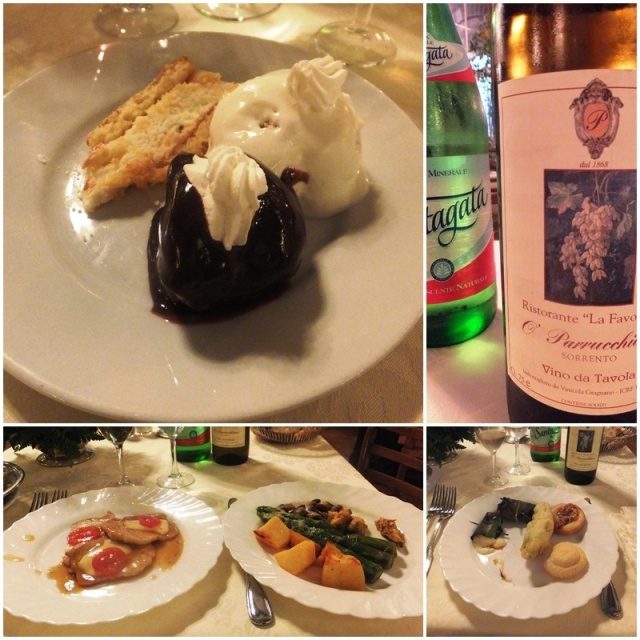 The main dish was simply sublime: Veal a la Sorrentina (in a wine sauce garnished with mozzarella and a tomato), accompanied by four different vegetables, a traditional dish from Sorrento. A delicious meal was capped off by the “Sinfonia Sorrentina” for dessert: a small sampling of chocolate and lemon profiteroles and a sliver of ricotta cake with pear filling. What a meal! I had had a great evening at O Parruchiano and thanked Enzo for a delicious dinner and the personal stories he had shared with me about his life and his business. I headed out into the warm Sorrento night and took another late evening stroll in the old part of town before having a good rest at La Favorita. Tomorrow was going to be a big day: I had planned a visit to Positano, one of the famous towns on the Amalfi Coast.